This is just a short little post to wish you all a Happy Valentine’s Day. Look what I baked Hubby. It’s his favorite treat, a double layer white cake with a rich butter cream icing. The saying goes that the way to a man’s heart is through his stomach but, for my man, I have to get past his sweet tooth before I can get anywhere else. I spent a couple of hours getting this ready on Sunday afternoon. Hubby was upstairs and he figured I was making cupcakes but I fooled him. He was pretty pleased to get the cake instead. 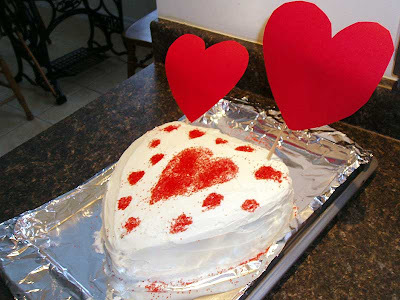 Hubby’s Valentine cake, the lucky fella! 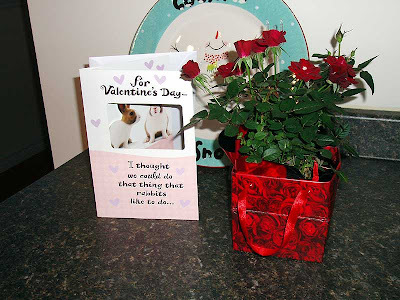 I got a lovely red mini rose bush and a really sweet card. These plants are great, I’ve had them before. Later this spring I’ll be able to plant it outside where it may last a few years. That’s all for now I guess. We had had another storm to day and more is expected overnight. Blah… How long until spring? 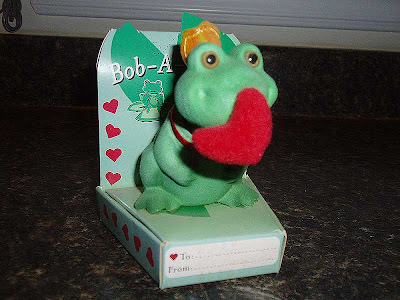 This little bobble-head frog just wants to wish you a Happy Valentine’s Day! and the same to you Happy Valentine's Day. That's one big cake for your hubby! I bet he was delighted with it. Fresh cake, lucky man! My poor hubby was left asking for the 'emergency chocolate' stashed away. Belated Valentine's Day to you. What a lovely cake...and from your own hands too. That makes it all the more special.